Despite a pledge by many Democratic candidates to eschew corporate PAC donations, health care lobbyists have funneled cashto many incoming lawmakers through the New Democrats PAC, the Blue Dog PAC, and other centrist committees. Unsurprisingly, the centrist New Democrats Coalition, the caucus of business-friendly centrist Democrats, has worked to depress momentum for “Medicare for All,” reprising the role centrist Democrats played in killing the public option during the Obama administration. In 2009, then-Sen. Joe Lieberman, I-Conn., a founding member of the New Democrats caucus, threatened to join the Republican filibuster against health reform unless the public option was dropped from the bill. By Lee Fang and Nick Surgey. 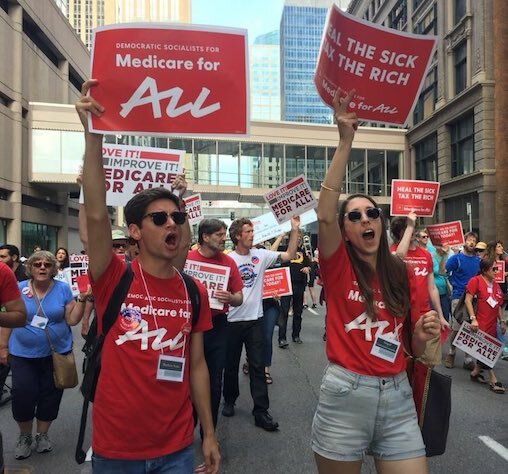 Published by Democratic Socialists for Medicare for All with permission from The Intercept in partnership with Documented.